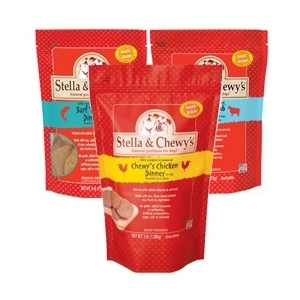 At Stella & Chewy’s, we’re dedicated to the simple proposition that pets should be healthy and happy every day of their lives. Just as their love is unconditional, so should the care they receive and the quality of what they eat. We also believe that dogs and cats deserve to thrive on pure, simple, minimally processed food – the way nature intended. That’s why our natural dinners aren’t cooked like most commercial pet foods. This is also why every patty is made with select organic produce and raw, USDA-inspected meat.